Sometimes in the summer I just can’t stop it with the ice activities. It’s hot out, anything frozen melts easily and I tend to go a bit overboard. What frozen kids’ activities (the activities were kept chill, not the kids) have we been up to lately? 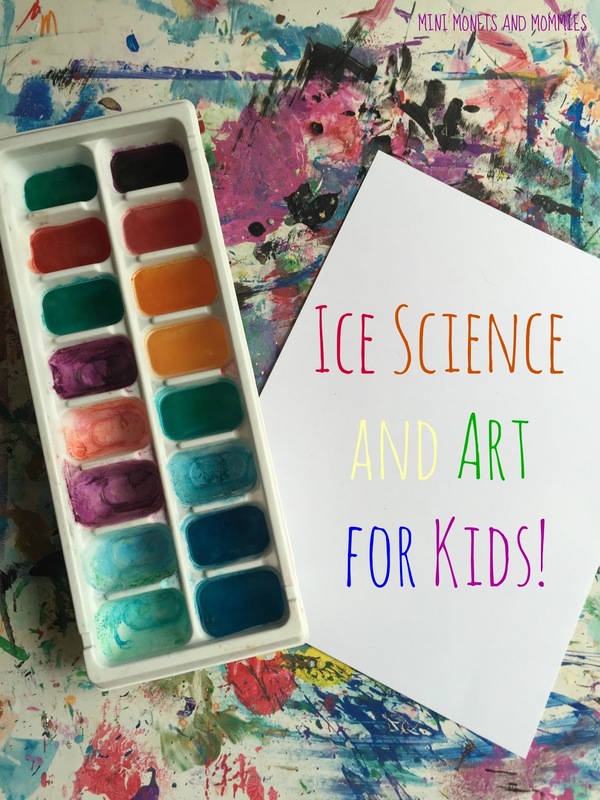 I’ve done icy building blocks, frozen chalk paint cubes, a rainbow race and now it’s time for timing how fast ice melts in different types of light (and it also doubles as a water color art exploration). This is super-simple, and combines science and art. Before you begin start with a few questions. Ask your child to predict how fast he thinks the ice will melt. He can give you a specific time (such as 10 minutes) or use his own terms (all afternoon, until bedtime, etc.). Discuss why your child thinks the ice changes from a solid to a liquid and if it can go backwards. · Timer – You can use your cell phone’s timer. 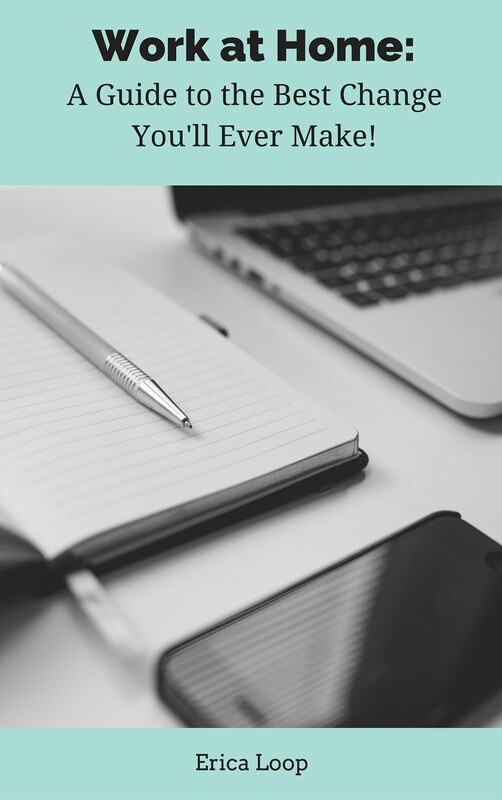 · Paper – Other than card stock (you can use notebook paper or pieces of scrap). 1. Drip one or two drops of food coloring into each compartment of the ice cube tray. Use a few different hues. 2. Add water. Stir the color and the water together. 4. Set up at least two (I used three, but you can create more) experimentation stations. Place the card stock inside and outside. Indoors, your child can pick a sunny window sill spot, a shaded table or another area. Outside, he can try an open light-filled area, under a tree or an in-between space. 5. Take the cubes out of the freezer. 6. Put at least two pieces of ice on each piece of paper. 7. Note the time for each ice placement. Write the time on a separate piece of paper. 8. Time how long it takes each ice station to start melting. 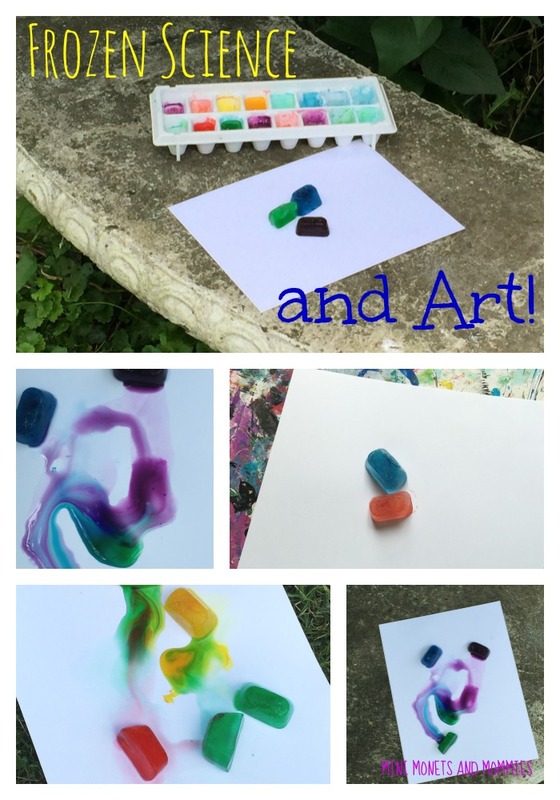 Wait until your child sees the water colors running out onto the paper. Note the times. 9. Paint with the melting cubes. Your child can push them around the paper, tilt the paper around or experiment with the process. 10. Compare the melt times. Ask your child to look at the data (i.e., the times that you wrote down). Which one took the longest to melt? Which one was the quickest? Why? You can use a piece of poster board and markers or crayons to write out the time differences. Have your child point to the biggest numbers and the smallest. Are you looking for more science and art activities? Follow my Pinterest board for ideas!